Tonight: Periods of rain showers. Widespread fog. Lows around 34. North winds 10 to 15 mph. Chance of rain 90 percent. Tuesday: Mostly cloudy with scattered rain showers, possibly mixed with snow in the morning, then sunny in the afternoon. Highs 45 to 50. Inland, north winds 10 to 15 mph. Near the shore, north winds 15 to 25 mph becoming northwest 10 to 20 mph in the afternoon. Chance of precipitation 40 percent. Tuesday Night: Clear. Lows 28 to 33. Northwest winds 5 to 10 mph becoming west overnight. Wednesday: Much warmer. A 20 percent chance of rain showers in the afternoon. Partly cloudy. Highs around 65. Southwest winds 5 to 10 mph with gusts to around 25 mph. 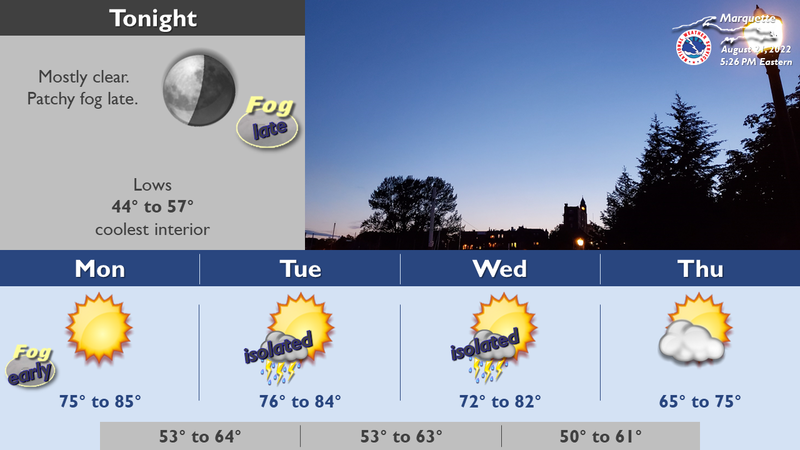 Wednesday Night: Mostly cloudy with a 40 percent chance of rain showers. Lows around 44. Southwest winds 5 to 10 mph. Thursday And Thursday Night: Mostly clear. Highs around 60. Lows around 36. Friday: Cooler, sunny. Highs around 51. Friday Night: Mostly clear. Lows around 31. Saturday: A chance of rain showers, possibly mixed with snow in the morning, then rain showers likely in the afternoon. Cloudy. Highs around 45. Chance of precipitation 70 percent. Saturday Night: Rain showers, possibly mixed with snow in the evening, then a chance of snow showers, possibly mixed with rain overnight. Cloudy. Lows around 31. Chance of precipitation 60 percent. Sunday And Sunday Night: Mostly cloudy. Highs around 43. Lows around 29. Monday: A chance of rain and snow showers in the morning, then a chance of rain showers in the afternoon. Mostly cloudy. Highs around 45. Chance of precipitation 40 percent. still have over a foot of snow on the ground. expected to fall back below bankfull until Wednesday afternoon. The East Branch Escanaba River at Gwinn. * from this evening to Thursday morning. * At 9 AM Monday the stage was 4.8 feet. * At 7.9 feet...Water reaches the bottom girder of the M-35 bridge. * At 7.0 feet...Low lying areas of Peter Nordeen Park begin to flood. exercise caution when walking near riverbanks. to the National Weather Service.